Happy Friday and cheers to a 3-day weekend! 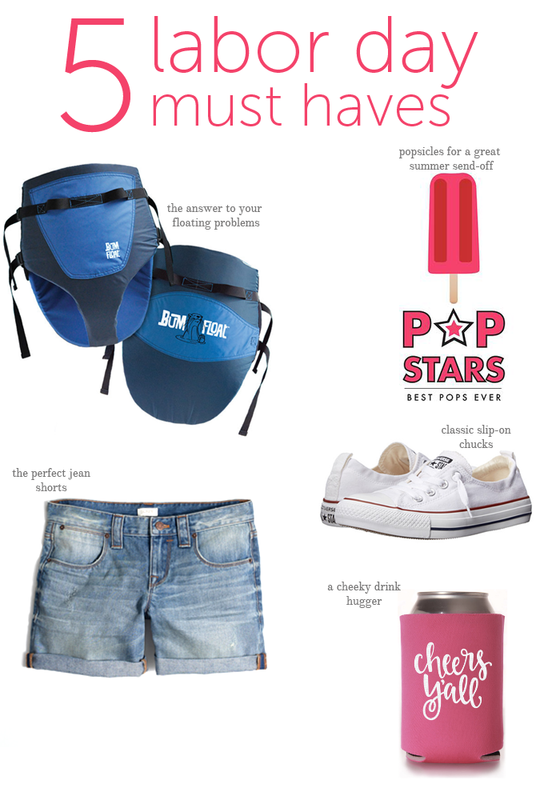 As you bring your work week to a close and start planning your festivities, I wanted to bring you 5 Labor Day Must-haves. You'll have everything you need for a fabulous weekend with family and friends! 1. BumFloats for the family: If you're a lake, river, or beach dweller, you know the upside down life jacket trick. But BumFloat takes that concept and makes it better. With BumFloat, you're given a comfortable, fitted alternative to the upside down life jacket. Get one for the whole family here! 2. Pop Stars as a summer treat: Say farewell to summer with Pop Stars, Atlanta's latest all-natural popsicle brand. Pop Stars popsicles have absolutely incredible flavors that will please everyone at your cookout. 3. Slip-on Converse: These have been my go-to shoe all summer, and you'll love having them as an addition to your closet. Get them on Zappos for quick shipping and a great deal. 4. The perfect denim shorts: This pair of denim shorts have a great length and the perfect cuff. If you're in the South, you'll be able to wear these well into the fall (pair them with your chucks & a light weight sweater). P.S. These are 50% off this weekend making them under $30! Shop now. 5. A cheeky drink hugger: I love these from Winnie Jean because they're cute and come in a variety of colors. Tip: buy one if your favorite college team colors for a season of sipping! I agree! All these are required for a perfect Labor Day weekend! I could really use that Bum Float this weekend at the beach! !